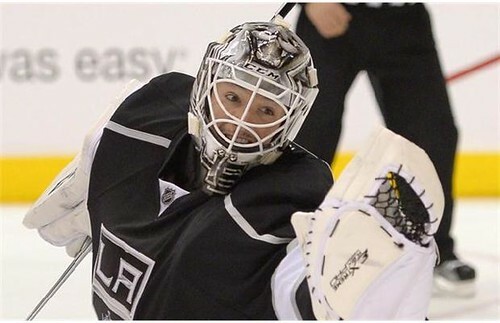 The Toronto Maple Leafs have acquired Los Angeles Kings backup goaltender Jonathan Bernier in exchange for forward Matt Frattin, backup goaltender Ben Scrivens and a second-round pick in either the 2014 or 2015 NHL Entry Draft. I'm a big James Reimer fan, and the addition of Jonathan Bernier tells me Dave Nonis isn't sold on Reimer being a number one goalie. Bernier was stuck behind Jonathan Quick playing only 62 career regular-season games with the Kings, compiling a 29-20-6 record, .912 save percentage, 2.36 goals-against-average and six shutouts. Is Bernier marginally better than Reimer or is he going to be another Toskala? Frattin played well for us. Going to miss him. A good trade. I do t think Scrivens/Reimer were the duo to move forward. Bernier will be good for Reimer. His stats are impressive and he's only 24 years old. The future looks brighter. Sorry make that NOT THE DUO TO MOVE FORWARD! Hmmmm....trade for a back-up and give up your back-up plus throw in a good young player and a 2nd rounder..this is why Nonis got turfed out of here - stop him before he sets the Leafs back another 5 plus years. Oh, and thanks for increasing the value of a true number one, like Lou. Well, maybe this will make the Leafs a bit worse so my Habs can win all their games against them. That would be good. I like Reimer but I also like the deal. The upside is much greater than the downside. Giving up Srivens, Fratten and a 2nd rounder is not that bad. Had it been Kadri or Gardiner I would have hated the trade. @ Phil - Vancouver's playoff problem is not Luongo, its the Sedin sisters. They're great in the regular season but once the playoffs start, the refs lay off the whistle and they disappear. @ Argie - No doubt the sisters are a problem, but Bobby-Lou tends to check out in key situations as well. I believe Bernier is better than Scrivens, with a bigger upside. At 24, he played behind the best goalie in the league and was lights out in 10 starts last season. We gave up a nice forward in Frattin, but he was never going to be a top 4 forward. He's nothing special. And I'm told the 2nd rounder is for a weak draft year, unlike this year. So the risk in minimal and Bernier could be something great. I feel a lot better about this trade today than I did yesterday, but only time will tell. At this point in time, I like the trade, but as others have said, only time will tell. Must be a slow sports day in Toronto when people are talking about the Maple Leaf's trading back up goaltenders in late June. I like the deal. It's never a bad thing to improve your team, which I believe that Nonis did. I love Reims as much as the next guy, but he struggles with rebound control and shots to the glove side on occasion. Maybe Bernier will be the second coming of Cujo, who's to say? Sweet, sweet poetic justice. Bruins give up two in the last 85 seconds to LOSE a series. The hockey gods giveth and they taketh away.